Adds color and texture to a landscape in late fall and winter. 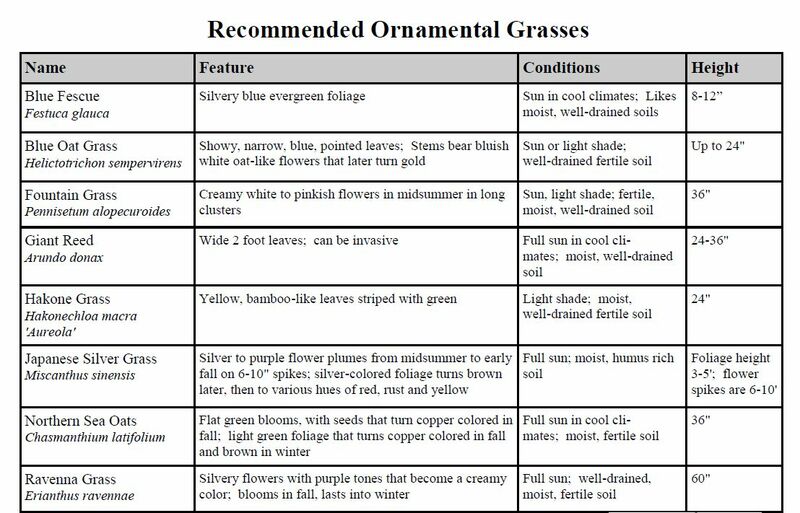 So many ornamental grasses are available that you have a number of choices among those that are well behaved and unlikely to pose a future threat to your land-scape. They range in size from low, compact plants to huge giants. Some are showy all season and others add color to a home landscape in late fall and winter when the scenery is otherwise drab. Look for the one that will appropriate for your area. A collection of 12-foot Giant Reed Grass (Arundo donax) can be a gorgeous traffic-stopper in a park, but quite out of place in a small backyard. A few grasses are suitable for northern gardens, but most grow best in Zones 5 (our zone) and warmer. In cooler zones, cutting back those that are half hardy and mulching them with evergreen boughs offers winter protection, but then, unfortunately, you lose their attractive fall and winter color. Nearly all ornamental grasses become dormant in the winter in our cold regions. Ornamental grasses, depending on their habit of growth (clumping or spreading), can be used in many areas of the yard. The key is making a good match, so you are not constantly reining them in or wishing you’d planted more. Slopes and banks. 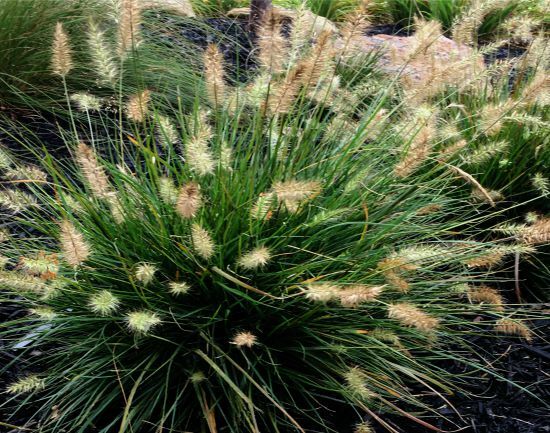 Ornamental grasses are a good choice for stabilizing steep or uneven ground or for preventing erosion. They can grow in places you cannot or do not wish to mow, and their deep roots will anchor the soil. Once established, they should also crowd out weeds or other unwanted plants. Curb strips. 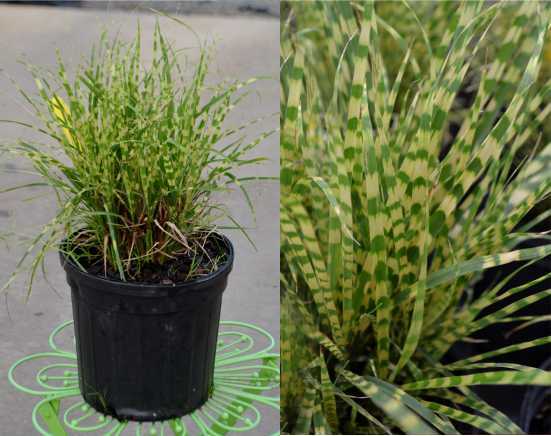 These grasses make a tough, eye-catching planting, if you don’t want to maintain lawn grass there, or if you consider flowers or shrubs too vulnerable or too high-maintenance. Perennial borders. Choose candidates with care, or plant lusty growers in containers, before introducing ornamental grasses to a flower bed. They can look wonderful in the company of plants for sun and soil. A popular combination with good reason, is fountain grasses with Black-Eyed Susans, Coreopsis, and other domesticated wildflowers. Containers. 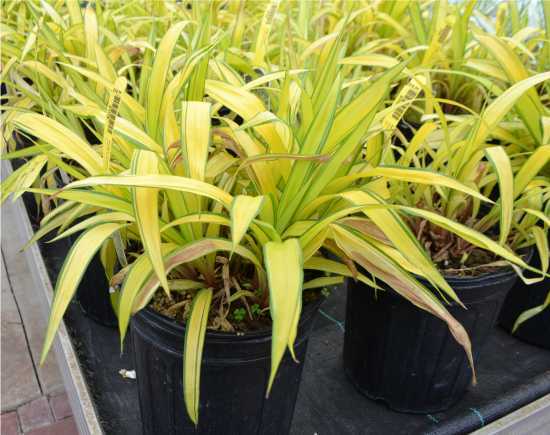 Aggressive but handsome grasses look terrific in large containers. A pair set in formal iron or terra cotta pots flanking a doorway, stairway or garden entrance can be very dramatic. Whatever you decide, be sure to site it first, because a pot full of soil and plants may be too heavy or unwiedly to move around. One last note: If the grass you want is not hardy in your area, potting it (and bringing it in during the winter months) might be worth trying. Most ornamental grasses like full sun, but some tolerate partial shade. Most prefer good to average soil that is well-drained but some like it boggy. Unlike lawn grasses, fertilize them only if growth is poor. Mow or cut back annualy in late winter or early spring.